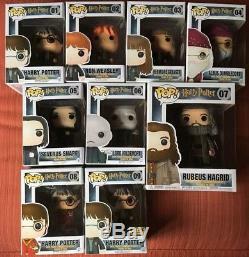 Funko Pop Harry Potter Complete 1-64, AND listed Rides, 2-packs and 3-packs in original boxes. 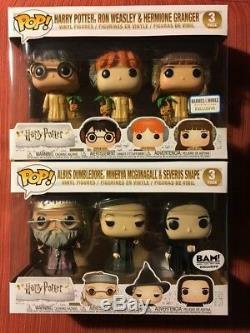 You will receive ALL the POPs listed below-read each description. 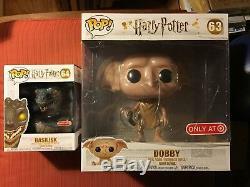 Sent in 2 BIG boxes-I will send you both boxes' tracking info. 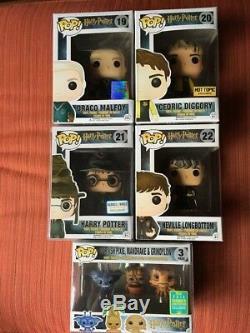 Figures #23-25 are part of a three-pack. 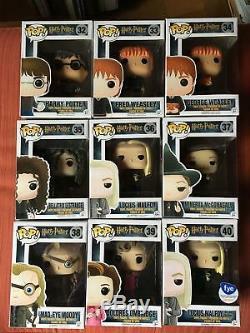 Wave 1 01 Harry Potter 02 Ron Weasley 03 Hermione Granger 04 Albus Dumbledore 05 Severus Snape 06 Lord Voldemort 07 Rubeus Hagrid 6" 08 Quidditch Harry Potter - Hot Topic 09 Harry Potter w/ Sword of Gryffindor - Hot Topic Wave 2 10 Triwizard Tournament Harry Potter 11 Yule Ball Hermione Granger 12 Yule Ball Ron Weasley 13 Draco Malfoy 14 Luna Lovegood 15 Yule Ball Albus Dumbledore 16 Sirius Black 17 Dobby 18 Dementor 19 Quidditch Draco Malfoy - Hot Topic 20 Triwizard Tournament Cedric Diggory - Hot Topic 21 Sorting Hat Harry Potter - Barnes & Noble 22 Neville Longbottom - Barnes & Noble (Pre-Release) 23 Cornish Pixie (Part of 3-Pack) 24 Mandrake (Part of 3-Pack) 25 Grindylow (Part of 3-Pack) Wave 3 26 Harry Potter Triwizard w/ Golden Egg - Target 27 Harry Potter "H" Sweater - Hot Topic 28 Ron Weasley "R Sweater - Hot Topic 29 Bellatrix Lestrange Azkaban Prisoner - Hot Topic 30 Lucius Malfoy Death Eater Mask - Hot Topic 31 Harry Potter w/ Hedwig - Hot Topic 31 Harry Potter on Broom - 2017 SDCC 32 Harry Potter w/ Prophecy Orb 33 Fred Weasley 34 George Weasley 35 Bellatrix Lestrange 36 Lucius Malfoy 37 Minerva McGonagall 38 Mad-Eye Moody 39 Dolores Umbridge 40 Lucius Malfoy Holding Prophesy - FYE 41 Luna Lovegood with Glasses - 2017 SDCC Wave 4 42 Harry Potter w/ Marauders Map 43 Hermione Granger w/ Time-Turner 44 Ron Weasley w/ Scabbers (box damaged figure fine) 45 Remus Lupin 46 Ginny Weasley 47 Luna Lovegood w/ Lion Hat 48 Peter Pettigrew 49 Remus Lupin Werewolf - Hot Topic 50 Ginny Weasley Quidditch Robe - B&N 51 Harry Potter w/ Firebolt - BoxLunch 52 Boggart as Snape - 2017 NYCC 53 Ginny Weasley Quidditch Broom 54 Ron Weasley Quidditch Broom. 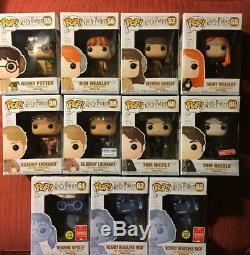 Wave 5 55 Harry Potter Herbology 56 Ron Weasley Herbology 57 Hermione Granger Herbology 58 Ginny Weasley w/ Diary 59 Gilderoy Lockhart tan 59 Gilderoy Lockhart blue - B&N 60 Tom Riddle 60 Tom Riddle Sepia - Target 61 Moaning Myrtle - 2018 SDCC 62 Nearly Headless Nick 62 Nearly Headless Nick GITD - 2018 SDCC 63 Dobby 10" - Target 64 Basilisk 6" - Target Multi Herbology 3-Pack: Harry, Ron, Hermione - B&N Professors 3-Pack: Dumbledore, McGonagall, Snape - BAM 2-Pack: Fred & George Weasley - BAM 2-Pack: Harry Potter & Lord Voldemort - FYE 3-Pack: Harry, Ron & Hermione - Barnes & Noble 3-Pack: Cornish Pixie, Mandrake, Grindylow - 2016 SDCC (Wave 2 23-25). Rides (not pictured but included). 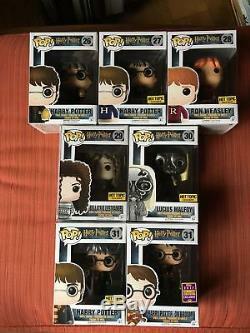 20 Hogwarts Express Engine w/ Harry Potter. 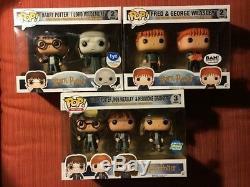 21 Hogwarts Express Carriage w/ Ron Weasley. 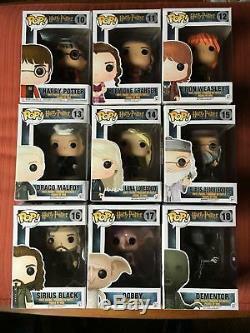 22 Hogwarts Express Carriage w/ Hermione Granger. 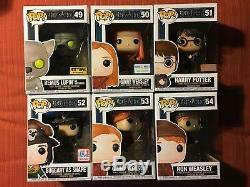 The item "Funko Pop Harry Potter 1-64 COMPLETE, with Rides, 2&3 packs listed all included" is in sale since Wednesday, January 16, 2019. 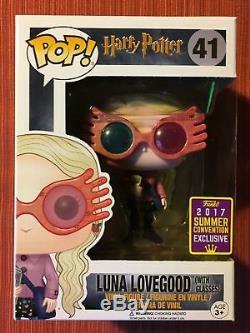 This item is in the category "Collectibles\Pinbacks, Bobbles, Lunchboxes\Bobbleheads, Nodders\Modern (1970-Now)\Funko". 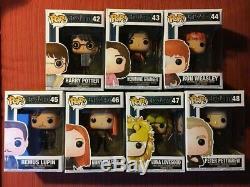 The seller is "tracymatt123" and is located in Williamsburg, Virginia.